If you are a passionate cook, you will agree with me that there are thousands of kitchen appliances that you need to make your food preparation easy. However, not most people agree that a strawberry slicer is an essential kitchen tool. What they don’t understand is that if you must cut tons of strawberries when you are making your favorite pudding and other dessert salads, the slicer can be a savior from messy work. 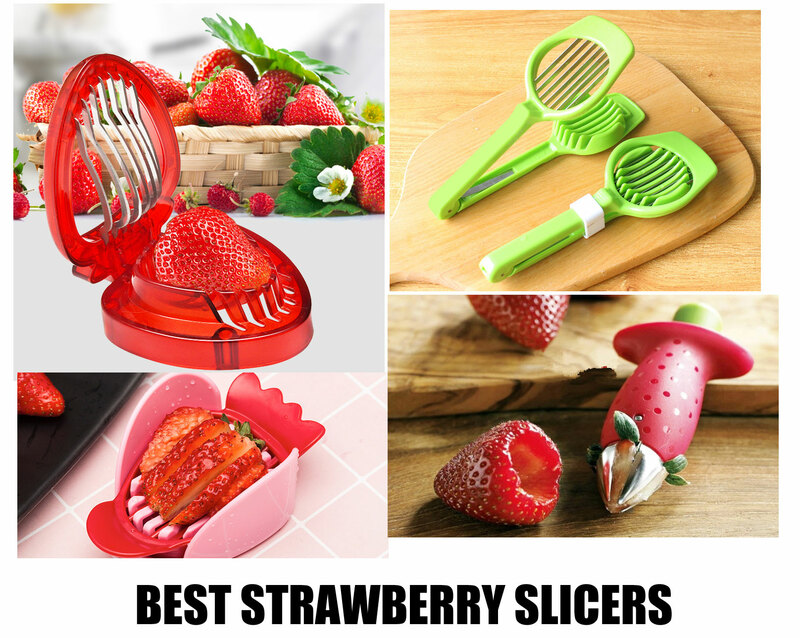 In addition, we know that for you to reap the benefits of buying a strawberry slicer, you need to choose the best item. Thus, we have searched for the best slicers in the market to make your work easy as you will see. Let’s watch the video first. We all know from the name that the kitchen gadget is meant for slicing your strawberries into thin and thick slices. Of course, most people will argue that they can slice the strawberries with the knife but there’s no fun in that. Remember, the small item keeps your fingers safe as you are cutting the strawberries. You can also use it to slice your hard-boiled eggs for various other recipes. I find it hard to cut the eggs with a knife as it quickly crumbles. With the slicer, everything comes out perfectly. All these tiny items can be frustrating to cut with a knife as your hands are exposed to the risk of accidents. The slicer makes your work easy when it comes to cutting pickles. Food preparation has never been this easy with the right tools. 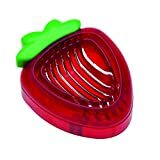 Chef’n strawberry slicer is your hand-held kitchen tool that slices your strawberries with a single press. Its white and red color enhances the kitchen counter outlook when placed on the counter. This one makes your work easy, unlike other slicers, because it slices the strawberries then simply drops them in the bowl or blender. You don’t have to open the slicer to remove the strawberry pieces. Ultimately it reduces the mess as you are working. You can use this item to cut all kinds of strawberries whether soft or hard. Remember, if you have the soft strawberries, you will need to hard press it for it to cut desirable slices. Additionally, you may use the slicer to cut other soft fruits. It features a sharp stainless steel blade that won’t absorb the bad odor. When it comes to its cleaning you should place it under the running water or you can put it in your dishwasher. On the downside, cutting a large strawberry is impossible if you haven’t cut it into sizeable pieces to fit in your slicer. Although it’s mostly used to cut your hard-boiled eggs, it works best for strawberry slicing as well. 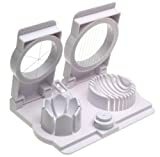 The item is made using the plated chrome zinc for durability. The blades, on the other hand, are of stainless steel. It defines a high-quality construction that would work best when you have heavy duty tasks to take on. With this cutter, you can make wedges and thin slices as well as peeling some of your other fruits. The compact design of slicer is dishwasher safe and easy to clean with warm soapy water. 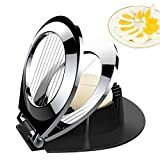 For the perfect and easy food preparation, buy the egg slicer. 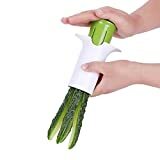 Note that, you can use it to cut any kind of soft vegetable and fruits. Another high-quality strawberry preparation tool. If you have always wondered how you are supposed to stem or hull your strawberry without causing a mess in the kitchen, use this tool. It will remove the stem and core the strawberry quickly. It’s your safe measure to use in hulling your strawberry as opposed to the regular knife. It’s easy to use as you simply insert the stainless steel claws, push it inside and twist then remove and you have your hulled strawberry. The best part is that you may use it for all the other soft veggies and fruits. The huller makes your work easy especially when you have a load of fruits and veggies to core. It comes in a bold color that makes it easy to find amidst other tools in the drawer. The item is dishwasher safe and you can also hand wash it. This is another design of cutter where the rapid slicer holds the fruits or veggies in place as you cut them with a knife. From tomatoes, grapes, cherries, grapes and strawberries cutting all the soft veggies has never been this easy. While it’s mostly used for slicing your favorite fruits, you could use it to cut the chicken breasts and different kinds of bread. Some people use it to cut the shrimps into the bite-size pieces. You don’t have to search further for an item to cut your fruits salads to bite sizes for kids. The aim of the rapid slicer is to keep your hands safe from the regular knife cuts. The top handle keeps the fruits or food static thus giving you a safe cutting as your hands are away from the knife. It has a non-slip foot to keep your food stationery as you are cutting. You can use this item if you need some extra control while cutting the food and especially those with arthritis. You may wonder how you will cut your bagel and small tomatoes with the same tool but the answer is easy you can adjust the slicing size to suit your food item. The item is BPA free and dishwasher safe and the best tool to use since it’s versatile. Take a look at this little gadget, isn’t it just cute to have in your kitchen? It assumes the shape of a strawberry with 7 stainless steel blades to cut your strawberries into perfect slices. Aside from that, it will comfortably cut your other soft fruits. Since it’s small, you can have it even for your outdoor activities. It will make great slices for your pies, salads and cakes. It’s easy to use as you only need to press the top and the bottom. Remember, you shouldn’t put it in a dishwasher. Just wash it by hand instead. On the downside, cutting your large veggies and fruits isn’t easy. Also, you won’t comfortably use it to cut the hard fruits. There are several people who are reluctant to buy a kitchen item when it has only a single use. This one is the answer to your problem as it comes in as a multi-use item. The first part is the slicer which will slice your foods using the 10 slicing wires. Next is the wedger that cuts your eggs, fruits and veggies into 6 pieces. This is ideal if your recipe calls for wedges and not slices. You also have the built-in egg piercer that shells your hard-boiled eggs. You can also use the garnish tool to make the edible pieces of fruits and other foodstuffs for garnishing. Both the slicer and wedger have lips that protect your hands when you are working with it. On the downside, the lip dangles when storing or washing the item. The best part is that dishwashing this item makes your work easy because it’s big and connected to many other tools. Notice that, this one is bigger in size than most other strawberry slicers and can, therefore, take on the heavy-duty tasks. Make sure you use it with fruits and foodstuffs that aren’t too hard. This one prides itself of being able to take on heavy duty tasks. Made of food grade 430 stainless steel and the tough rust-resistant stainless steel the blades define the slicer. This means that it’s safe to use. Using it is even easy as you just need to press the slicer gently to come up with the perfect slices. The item is versatile since you may use it to cut the strawberries, eggs, mushroom, kiwi and different other salads. The depression design of cutters helps you to get more delicate cuts that you would rarely get when using the regular knives. Cutting the strawberries is easy and fast saving more time for you to take on other tasks. Your hands further remain safe from the blade’s cuts. Here is another unique kitchen knife tool that gives you the opportunity to have a fun cutting experience. If you are the person who loves working with your kids then this is your must-have tool. It’s safer than using the knife because it keeps your hands off the blade. It features a product made using the ecofriendly, PBA and PVC free, food grade and phthalates free plastic and stainless steel material. The ergonomic design of slicer comes in red and white color. They are easy to use because you only need to fill it up then swipe. From your tomatoes, to cherries to strawberries, to bananas and to applies the slicer will cut your items without breaking them into pieces. The best part is that it slices all the different sizes of the strawberry fruits and your kids will enjoy eating their own fruits. For its cleaning, consider putting it in the dishwasher. Another multipurpose and easy to use tool is this one. It’s made using the high-quality ABS material that is easy and safe to use. 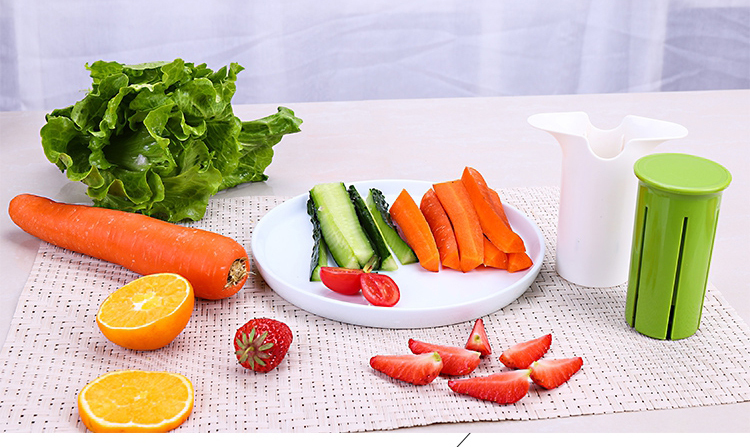 It features the 6 blades that make the cutting of the strawberry, cucumber and carrots easy. It’s sturdy in construction and a good tool for quicker food preparation. The item is durable to use and it allows you to make the different designs of fruits to excite your guests. It works when you put the strawberry in the tool then push it to make the slices. The push button is large enough for every palm size. Its blades remain enclosed thus making you safe from unnecessary cuts. If you are looking for a smarter tool to cut your strawberries into the restaurant style garnishes and salads then buy this slicer. Westmark is a German brand that we all ought to trust because of its effectivity. It’s one of the best kitchenware brands in the market today. The body features the cast iron material to offer quality and durability. On the other hand, its blades are made of stainless steel and they are not only sharp but also corrosion resistant. It’s a versatile tool for use in that you can use it to cut your hard-boiled eggs, kiwis, strawberries and mushrooms among others. The handle is non-slip and ergonomic design for easy usage. You can cut your fruits fast but what’s even ideal is that the item is comfy to use. The item though a little heavy because its body is made using the cast iron and stainless steel is a quality item that you will enjoy having. The best way to clean this item is just to handwash it with the dishwashing soap and warm water. The one thing that makes this slicer to stand out is the fact that it’s light and therefore portable. Coming in a bright red color, you will see it amidst all your other kitchen tools in the drawers. The strawberry slicer requires you to use a single hand in cutting. You can further use it over the bowl. This item makes it easy to cut your desired items quicker and precisely yet uniform. It keeps your hands out of contact with the blades yet the plastic material is BPA free. Like all the other blades above, this slicer is made using the stainless steel blade for effectivity. Whether you want to cut your grapes, bananas or strawberries this is your on the go-to tool for use. It’s a dishwasher safe item and a high-quality item that further offers quality service. For a great innovative tool that is not only easy to use but also safe to buy the casabella slicer. 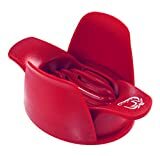 Coming in the bright red color you can place it at any part of your kitchen counter. It’s also sturdy in construction that prevents the tendency for food slices to fall off. It’s best used for strawberries, eggs, mushrooms as well as other food items. Since it’s small, you can easily store it in the kitchen drawer. If you like to make salads and snacks, this is a must-have tool. This great tool has the sharp wire blades to allow for cutting of your food items. The drawback is that it can break easily so, only use it for soft fruits and hard-boiled eggs. For its cleaning, just use the dishwasher. Here is an item that will improve your culinary skills thus leaving your friends in awe of your food presentation. With the simple 3 in 1 tool, you can create some awesome fruit related dishes. The moment you buy it, begin to have your imagination and creativity go wild. You can use this tool to slice your soft fruits especially the strawberries as you hull and remove the stem. The tool makes it easy to remove the pineapple eyes that remain once you have cut off the outer parts. All these processes are easy to take on. Additionally, you don’t have to worry about the material used to make the slicer tools. This is because the fishy and fairy company aims at choosing the safest, nontoxic BPA-free materials. In that manner, you are sure to receive all the safe items for your family use. It’s so easy to use that even your own child can easily use it. Cleaning it is easy as you only need to handwash it with water and soap or throw them in a dishwasher. 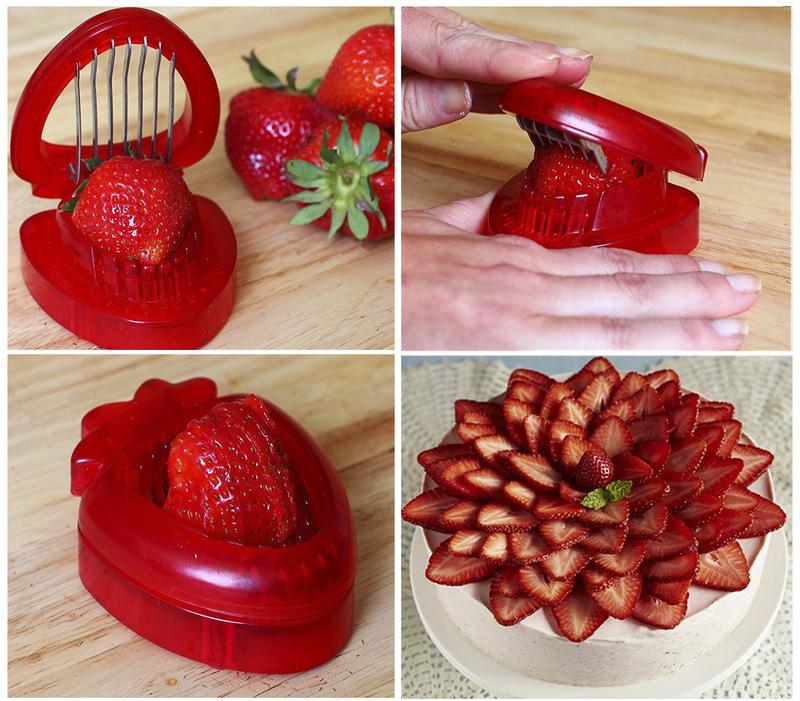 This is yet another versatile kind of strawberry slicer that will slice your other fruits. It’s corrosion resistant and safe to use by kids and the elderly alike. 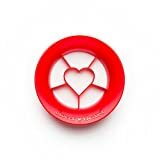 This little kitchen gadget features a heart design tool that you may use to design your fruits and other items. You will use it to cut the strawberry into the heart shape while you can cut other soft fruits to cube designs. Instead of investing in other complicated tools why not buy this item that with one cut you have the heart shape design to be part of your cakes, salads or garnishes. 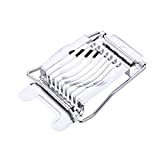 This item is not only easy to clean but also safe to use as your hands are away from the blades. Though it’s made using the plastic, the item is BPA free and FDA approved plastic making it a food grade plastic material. ‘If you are considering going for an event soon, buy yourself the Peleg slicer and present it as a gift. I like strawberries mostly because they enhance the outlook of your meals, are rich antioxidants and they improve your heart health among other benefits. But cutting it in large amounts can be tedious. Therefore, you need the strawberry slicer. In my opinion, all the above slicers are high quality. Furthermore, they mostly have multiple uses in the kitchen thus you will find that at a cheap price you receive multiple benefits. 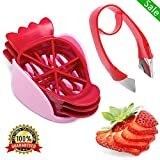 Nevertheless, I prefer PELEG DESIGN Sweet Heart – Heart Shaped Strawberry Cutter Strawberry Slicer Fruit Cutter because of its unique heart cuts.